It is said that a child’s smile can brighten up anyone’s day – imagine what would happen when 550 innocent smiles light up a place. This was the view that greeted attendees at NCUI Auditorium, August Kranti Marg, on November 19, 2017 on the launch of Smile Foundation’s ‘The World of Children’ initiative. Approximately 550 children from privileged and underprivileged background were present for the landmark event, which was graced by the Guest of Honour, His Holiness the Dalai Lama, amongst other prominent dignitaries. 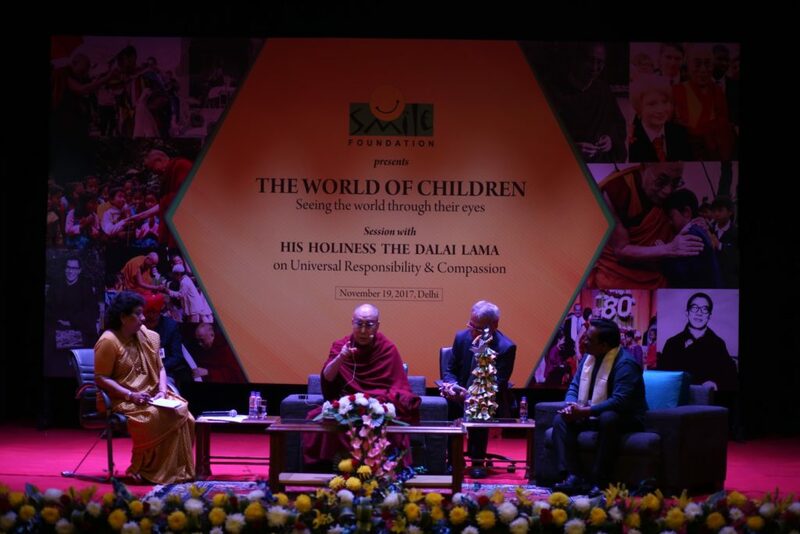 The event witnessed the launch of the initiative – ‘The World of Children’. Conceptualised as a one-of-its-kind platform that brought together children from diverse socioeconomic backgrounds, ‘The World of Children’ is aimed at enabling children to discuss their issues challenges, and ideas with each other, as well as youth icons and inspirational leaders from the world over. The initiative is aimed at helping children and adults understand the problems that plague today’s youth and to find the right outlet for their energy and enthusiasm through meaningful, thought-provoking discussions, relevant advice, and guidance. 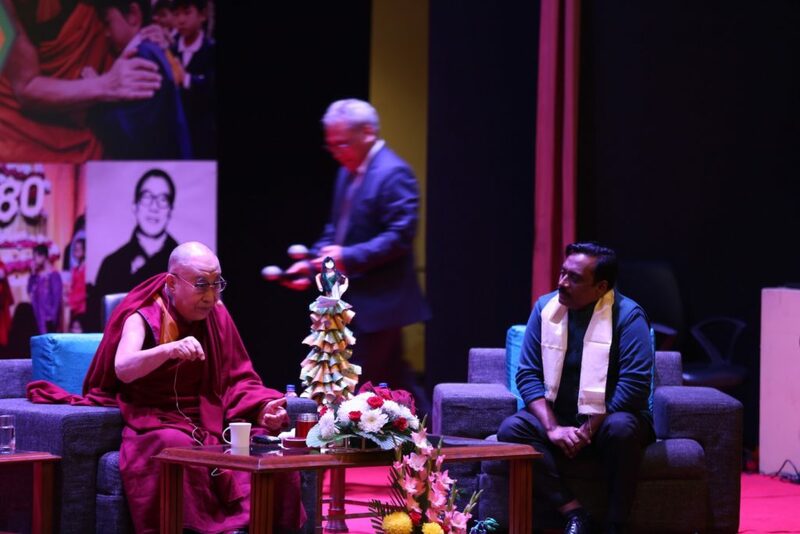 The event kicked off with the introduction and formal welcome of His Holiness onto the stage, followed by an address by His Holiness to the children in attendance. 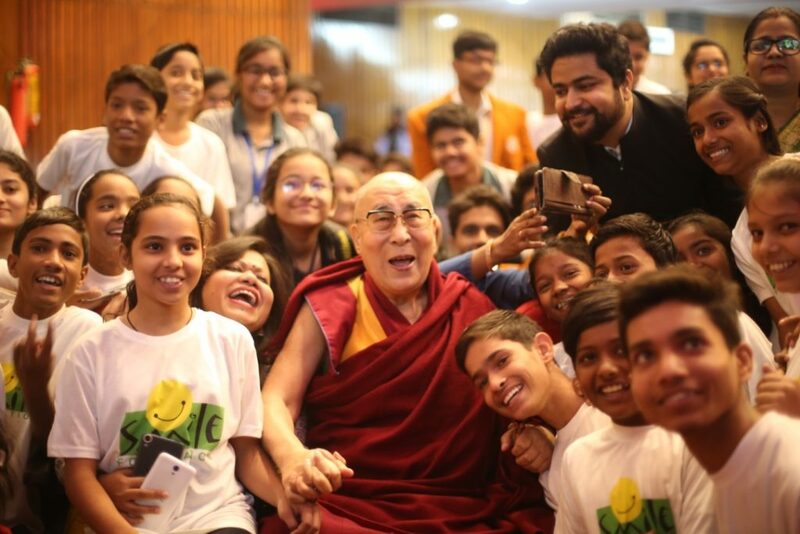 It was followed by another address and Q&A session between His Holiness and the students. Children from Gramin Vikas Samiti, Nai Disha, Ina Raja Memorial Education Trust, Neev – Mission Education centres of Smile Foundation and from the privileged schools – Bharti Public School (Swasthya Vihar), Bharti Public School (Mayur Vihar), Mount Carmel School, Queen Mary School, Kothari International, Victoria Public School, Mother Global Public School, and Ahlcon International School were the schools participating at the event. In today’s world, depression amongst children the world over is on the rise, as are other critical issues such as loneliness, insecurity, and anxiety etc. This has resulted in a rapid increase in drug abuse, violence, and suicide amongst school-going children of all ages. 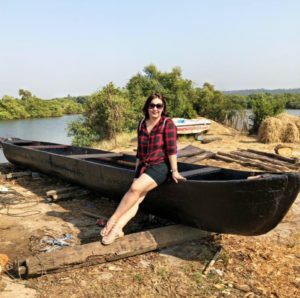 What’s worse is that these issues often either get swept under the rug because of the fear of social rejection, mistaken for a lack of will, or ignored. “Ignoring this problem will not make it go away, which is why we are looking to address it with our latest initiative, ‘The World of Children’. Through this unique, one-of-its-kind outreach programme, we are looking to encourage children from various socioeconomic backgrounds to openly discuss their problems with their peers and elders, and to find solutions to those problems through their own experiences, learning, and observations. This will not only help in raising greater awareness about the various issues that plague children today, but also in creating a supportive and nurturing environment that can help them in overcoming challenges, making the right life choices, and realising their true potential,” added Santanu. Established in 2002 to effect a positive change at the grassroots level, Smile Foundation has been ceaselessly working towards alleviating the problems and challenges faced by underprivileged children, their families, and their communities. Smile Foundation has won widespread recognition and accolades for its pioneering work in the field of child empowerment over the years, engaging and empowering underprivileged children, youth and women through relevant education, innovative healthcare, and market-focussed livelihood programmes. Smile Foundation is a national level development organization benefitting over 400,000 underprivileged children, their families and the community directly through 158 welfare projects on subjects such as education, healthcare, livelihood, and women empowerment across 25 states of India. Adopting a life cycle approach of development, Smile Foundation focuses its interventions on children, their families and the community.